Selling: Stiga Vintage Blades sealed, unused! Post subject: Selling: Stiga Vintage Blades sealed, unused! Hi, my name is Marcos Guglielmetti, I am from Argentina. I have these sealed, unused 5 ply Stiga vintage blades models from the 80's: Stellan Bengtsson and Kjell Johansson. I oppened one just to show you better photos, but I can send them sealed (lacred!). They are a relic and you can play with them. Last edited by marcosgg on 19 Aug 2018, 03:09, edited 1 time in total. Post subject: Re: Selling: Stiga Vintage Blades sealed, unused! Ah.. these are "premades" - the sort of racket you find at WalMart, etc. Yes, Stiga makes them, but they aren't all that good. You can still find their modern day equivalents at department stores, and people usually recommend that players (even beginners) avoid them, since they're usually slow and heavy. They usually have names of players on the packets. I don't recognize that "Taiphoon" rubber that's on them - it's probably similar to the stuff they put on the department store premades these days. 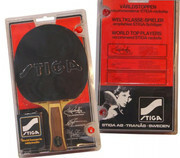 The real collectible blades, and the ones used by serious players, are the ones Stiga would sell bare, without rubber. Or maybe they'd have Mark V on them. The REAL collectible ones are the ones with the pictures of the eponymous players on the handles (I believe those were from the early 1970s). Ok, thanks Iskandar for your words. Today I was playing with them and I like the wood a lot. Total weight is 170 gr, they are not heavy (my Butterfly Korbel Sk7 with DHS Hurricane III Neo weights 200 gr). The Taiphoon rubbers doesnt match the spin and speed of the professional rubbers but you can still play and practice a correct table tennis technique with them (and I feel they are way better than the nowadays Stiga premade blades). It's entirely possible the blades are OK. The ones they sell these days aren't - if you look around the Web you'll find web sites where they've dissected premades (I can't remember if Stiga was one of the brands) - in one case there was a knot in the wood under the top ply. The other problem people have is that the rubbers are impossible to remove - whatever glue they use to put it on requires hours of work to get rid of the bits of sponge that get left on the blade when you try to pull the rubber off. In any case, if anyone wants to buy these, it would be for the historical value and they'd want to keep the racket intact rather than change the rubber and use it for serious playing so this probably isn't too important. Yes, In any case, if anyone wants to buy these, it would be for the historical value! I will change the rubbers soon and post the results. Taiphoon was a quite popular rubber in the late 80ies. Fairly similar to Cobra if I remember things correctly. Quite often recommended to young cadets by the coaches. For a collector, original condition is key. Do NOT remove the rubbers for this market. For sure! I will try it just in one of them. Very thanks, it was difficult to find some info on the net about them. It seems to be a rubber for control and learning. Stiga rated assembled rackets with stars ranging from 1 to 5 (probably still do). I will have better photos soon!